All transactions are safe and secure with a reliable history in online purchasing behind each of our associates. Buy the Whatever I feel like I wanna do, GOSH! 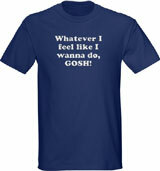 t-shirt to own Napoleon Dynamite clothing and merchandise. This Napoleon Dynamite tee is available in eight different colors, including black, maroon, and brown. The front of the tee features a cool Napoleon Dynamite quote from the movie. When a kid on Napoleon's bus asks him what he's going to do today, Napoleon replies, "Whatever I feel like I wanna do, Gosh!" Wear this T as part of a flippin' sweet Napoleon Dynamite costume. In addition to the Whatever I feel like I wanna do, GOSH! tee above, browse the Napoleon Dynamite Clothing Gallery for more apparel like men's and women's clothes, kids shirts or hoodies.